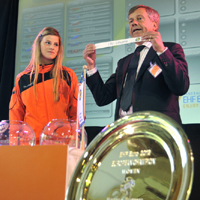 On 27 April 2011 the draw for the Women’s EHF EURO 2012 Qualification took place in Castle Nienoord in Leek, Netherlands. The draw was carried out by Jan Tuik, Chairman of the EHF Competitions Commission and Michael Wiederer, EHF Secretary General. The two were assisted by Angela Malestein and Larissa Van Dorst, members of the Dutch W19 national team. *The two last nations will be known after the Qualification Phase 1, where four teams – Greece, Great Britain, Finland and Israel – play for the two last places in the EHF EURO 2012 Qualification on 03-05 June 2011. The teams finishing on first and second place will qualify to the final tournament, which will take place between 02 and 16 December 2012 in the Netherlands.